Bean—without the Mr. usually appended to his name in the series of delightful comedy shorts featuring the character created by Rowan Atkinson—has now been stretched out to feature length in a version directed by Mel Smith, Atkinson’s former colleague on the BBC’s hit satirical revue of the early ’80s, “Not the Nine O’Clock News.” He does not completely survive the transition, but those who like Mr Atkinson’s brand of visual comedy will find a lot of what they like here. My own feeling is that it would have been better to have made three or four short subjects out of it, since the cumulative effect of Mr Bean’s implausible adventures is wearying, if not enervating. Yet it would be churlish to deny that there are an awful lot of funny moments packed into this film’s 87 minutes. 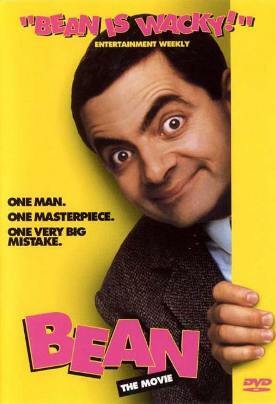 The rest is pretty much predictable, but no less funny for that, especially when the Californian gallery authorities make the mistake of leaving Mr Bean alone with the $50 million painting for a few minutes. This scene of scarcely imaginable disaster has about it the kind of inevitability that we expect from the greatest and most inspired comedy—which makes it the more regrettable that the film is otherwise so dedicated to straining credulity in order to land Bean in ever-more-unlikely comic situations. Yet if you can get over wondering why the curator thinks it a good idea to invite Bean to stay in his house and (naturally) drive away his wife (Pamela Reed) and their two bratty California children, or why Bean should suddenly be mistaken for a surgeon, fitted with mask and gown and put in charge of a life-and-death operation, you won’t mind the increased opportunities these situations afford for Atkinson’s distinctive brand of visual humor—especially insofar as this is preoccupied with bodily fluids. It is also rather a pity that the film’s brief attempts at satire of the art biz—the marketing of Whistler’s mother “from fridge magnets to frisbees”—ultimately come to nothing. True, it is too intellectual and verbal a concept to mix well with the Atkinsonian pratfalls, but I was beginning to enjoy the comic possibilities of the marketing man’s risqué poster of “Whistler’s sister” and even “Whistler’s whistle” as a kid’s toy before they pulled the plug on them. More also could have been made of Bean’s calculated appeal—stressing to an appreciative audience of touchy-feely Californians that “families are important” since Whistler went to all the trouble of painting this “hideous old bat” and “mad old cow” whom, nevertheless, “he thought the world of”—in his comic speech at the unveiling. But you very quickly get the idea that the only way to get on with Mr Bean is to go with the comic flow, and this will be for most people a very easy thing to do.